On Monday, the second day, we woke at 6, with the sun. Even though we completely keished the night before at 9 pm and slept like the dead, the mattresses were thin, and they slowly worked to make our hips tender and so, at 6, we were all up. Breakfast was eggs and bread, and mielie-meel, again. 2 eggs on bread, then bread with peanut butter spread thick, and 2 bowls of mielie-meel. We ate a huge breakfast. And coffee. 3 little boys were playing with rheumatic marbles deftly aimed at each other, and ultimately at a small marble-shaped dent in the dirt. The chickens were up, and the duck, with her tiny yellow duckling, miraculously safe among the brilliant dogs. Vuyani helped me show our hostess how to take a photo with an iPhone. And we set off just before 7, heading south – ever south – and slightly west, down the hill, to the sea. The first house we came to on Sunday morning was down the gentle slope to the sea. This lady had come down from the city. She wanted a change, so she asked the chief, and he said she could live on this plot of land. She has 2 Landrovers, a thriving vegetable garden resplendent with cabbages, and a clear view down to the sea. We passed the house of the wife of Ghotso, who was a famous healer and oracle who had once given a lady a self-replenishing 10-rand note. Next to her house was a large trailer with “LALA PHANTSI” written on its side: Lie down. Across the river we came to the first white-man’s cottage – the first cottage that isn’t part of a village, that wasn’t given by the chief to a community member. This cottage was being used by 28 churchmen on a weekend retreat. They gave us oranges, and we watched dolphins surfing the waves around the river mouth. On Sunday night we slept at Rhole. 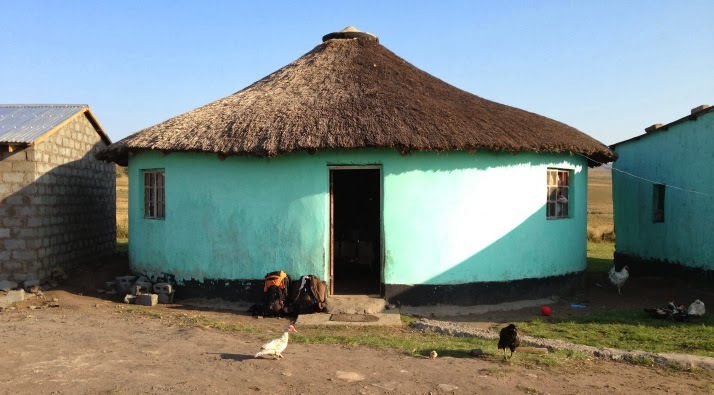 This village is where Vuyani’s mom grew up – her name was Tezana, which is the same name as the river that runs next to the village, and the forest that grows beside the river. Our rondavel was large – large enough that our hosts had set up a lounge with a sofa and armchair set, with tea-towel antimacassars with a print of an egg on them, and a dining room, with a table and 6 chairs. Beside the lounge was a sideboard with 2 large thermos flasks, 2 clocks stuck on 10 past 2 and 10 to 3 respectively, an assortment of coffee cups, and a 7-piece pot set with holographic stickers on them, stacked one on the other. The floor was covered in a variety of large pieces of linoleum, and our beds arranged around the wall. The wall was washed bright pink all round, with a light-blue band at the bottom. We had all spoken happily about a siesta, but instead Mandy went out to play jump-rope with 3 little girls, Margaret & I took a stroll down to the sea, and then we all hit the shebeen: Black label quarts, Old Brown Sherry and a hip-flask of tequila. We sat on beer crates and stacks of mud&straw bricks until it was dark enough that we could pop round the corner to pee unseen. About 12 km south of Port Edward, just beyond Port Grosvenor, the coastline rises. Flat and endless beaches become rock walls against the sea, and these in turn rise to become soaring sheer cliffs rising against the Indian Ocean, the cliffs indomitable and the ocean formidable. After the river at Goss Point we started walking alongside banks of squared-off rocks where the waves shoot up in huge walls of white water, twisting up from the angle of the swell, and caught in the wind, swept up and away. We walked down as close as we dared - you see the swells building, but you don’t see the waves forming and breaking below the lip of the cliff, so suddenly the wave crashes right up in front of you. We took photos and video of the waves breaking and us standing with our arms up and yelling. It looks deceptively reasonable in the photos: It was terrifying and awesome. An hour later we were walking high up above the sea - 50 meters up, looking down on the rock pools and mussel-banks. And the cliffs continued to rise until Waterfall Bluff came into view: A massive arm of rock jutting out into the sea, a cliff-face covered in slopes of bright green grass that shelters a small inlet where a waterfall falls clean from the land, into the sea. After the calm rolling of the coastal walk over the morning, this huge, almighty, craggy place with thundering waters and battering wind was overwhelming. The rest of the day we continued above the cliffs - high up, very high up, above the ocean. We stopped to look at Cathedral Rock - an impossible pile of rocks that the ocean had beaten a hole through - a hole large enough for a sailing ship. And beyond it, another island of rock with its own cavernous hole running straight through. And further on we walked to the edge of the cliffs, and lay down on a rock outcrop, and crawled to the edge and peered over, and there - waaaay down there, another waterfall, pouring straight from the rock into the sea, and whisked away by the wind before the it touched the sea. At about midday, we walked out of Waterfall Bluff, up to the river above it. We came to a large, wide pool in the river – a world away from the roaring ocean and the rushing wind. Dark, cool and still. We set our packs aside, and dived in. I put on my goggles - I could only see endless rays of golden green sunlight disappearing deep deep down - no bottom in sight, and full of monsters from the deep. We swam over to a little waterfall at the head of the pool and rested our heads back into the flow. The water was fresh, and cold. Lunch, like yesterday, was low-GI Albany bread, cucumber, thick slabs of cheese, beetroot and mayonnaise. Peanuts and raisins. And an assortment of chocolates. Sleeping at Cutwini on our last night, the wind blew and pulled at the corrugated iron laid over the thatch. At about 2 am, I got up to pee. When I came back in I closed the door, and Mandy said put the towel back in place, and I set the towel back in place, and closed the door and got back into bed and slept like an infallible elephant. Around 4pm on Monday, close to Cutwini Village, where we’d left our cars, and where we would finally set our packs aside and rest our weary heads and wear flip-flops evermore. From the Cutweni river we set off up the hill, the final hill. At the top, the sun was setting, casting rich yellow light through the hills rolling down to the sea where a whale was breaching – way off in the distance. We’d left the coast far behind now – we were inland now, following the cow-paths into the setting sun.